Presenting this case of sideswipe injury right upper limb in a 39 year old male. Patient referred and arrived at our centre yesterday 7 hours after the injury. Examination revealed lower end of humerus coming out of the large wound on the anterolateral aspect of elbow. Another large wound on the dorsum of the proximal forearm exposing the ulnar fracture. No distal pulse. Hand cold. Doubtful capillary filling of finger tip. No sensation of hand. Thumb mild flexor activity. At exploration: Contusion thrombosis of brachial artery just above the bifurcation extending to the bifurcation and a little beyond. Radial nerve avulsed. Median Nerve and Ulnar Nerve in continuity. Large amount of devitalised soft tissue. 1) Should we attempt limb salvage in view of the Median Nerve and Ulnar nerve which are in continuity in this young adult with the dominant upper limb inury? If so what are the procedures of options? 2) Should we go for primary above elbow amputation? Unfortunately we cannot wait for the list opinion and we have done something. I will present what we have done after discussion . 1. Upper extremity loss has a greater impact on function than lower extremity loss. 2. There are no guidelines for the upper extremity as limb salvage literature focuses on the lower extremity (really no firm guidelines there either). The upper extremity (UE) tolerates shortening. The UE has better reconstruction options - much better results with nerve repair and nerve grafting, tendon transfers. A stiff, insensate UE is often more functional than an upper extremity prosthesis. 4. The hand can't be replaced effectively in any shape or form by a prosthetic unit given the lack of tactile sensibility. 5. Literature review-no definitive answers: Patient with bilateral mangled UE's - one reconstructed, one amputated - the patient refers the salvaged limb for ADL's. One study tried to apply the MESS retrospectively to mangled UE's with many gaps - doesn't address the differences in function between the salvaged and amputated limbs, most amputations chosen based on neurological status (e.g. severe brachial plexus injuries) which isn't part of the MESS. I think it is reasonable to consider an initial salvage attempt, observation, and subsequent early secondary amputation, but maintain clear goals and communication with the patient and family that amputation may be necessary at any time during the salvage attempt, and that amputation is not failure. Fix the artery and debride the wounds and quickly set/ fix the bones. Would have to go back to OR of course. Give him a chance. If all muscle is dead, or unable to repair artery, do the amputation . I agree entirely w/ Mark Wasylenko. Thank you for the various responses. We have achieved limb salvage. Today it is over one week post op. FAVOURABLE: 1)Median Nerve and Ulnar nerve in continuity. 2)Structurally undamaged distal forearm and hand. 3)Healthy adult with no pre-existing medical conditions. 4)Understanding relatives who gave consent for above elbow amputations in the event of a life threatening complication developing. 5)Good looking forearm muscles at the end of debridement and re-vascularisation. 6) Patient who withstood the procedure well and maintained all parameteres well during surgery and post op period except requiring inotropic support for first day post op. UNFAVOURABLE: 1) 7 Hours of ischemia on arrival which was 9 hours at the start of procedure. 2) Avulsed radial nerve. 3) Requires two areas of skeletal stabilisation before revascularisation. 4) Two large open wounds of the said duration which requires debridement and coverage. WHAT WE DID: Explained problems and prognosis and got a detailed informed consent. Debrided and explored the wound. Stabilised the ulna on a small DCP and elbow on another plate(Primary arthrodesis with the condylar fragments as graft). Harvested a trifurcate vein graft from near the ankle and used it to revascularise the forearm. Waited to see the forearm muscles, radial pulse and patiet behaviour on revascularising. On getting a favourable setting, harvested Lattismus dorsi muscle from the opposite side and based it on the vascular pedicle of the vein graft to cover the vessels and implants in the wound. Basilic vein was reanastomosed.Small area required skin graft. External support given by a POP slab. Operating time about 10 hours. So far so good. 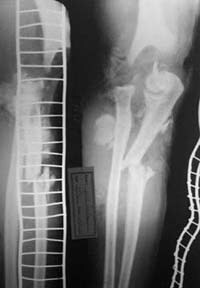 Will require extensor reconstruction after the present wounds,fracture and arthrodesis settle down.